New watercolors and charcoal drawings by Peri Schwartz on view at Garvey Simon Art Access, Inc.
NEW YORK, NY.- Garvey|Simon presents an exhibition of new watercolors and charcoal drawings by Peri Schwartz. This is her third solo show in New York and her first with Garvey Simon Art Access, Inc. This is also Ms. Schwartz’s first solo exhibition devoted entirely to watercolor painting and charcoal drawings on Mylar. Peri Schwartz can well be described as a formal composer of refracted and reflected light, space and form. A disciplined artist, she uses the humble subjects of her New Rochelle studio as her sole vehicle; a decades-long exercise to continuously evolve her skillful ability to translate the geometry and ethereal light that surrounds us onto a two-dimensional surface. Her art is an exquisite marriage of abstraction and representation. Although some describe her work as “studio still life,” Ms. Schwartz is not exactly a still life painter. She builds abstractions out of real forms. The objects do not inform the work as much as the artist informs the objects. Schwartz does not merely paint or draw what she sees; she first creates what she wants to see until it is there, and then she puts brush to canvas, charcoal to paper. She uses glass bottles filled with colored oils for their translucency and layers these vessels in front of each other until the desired hue or opacity emerges, and then she paints it. If she knows she wants a particular shot of color in her work, she will bring it in. She will physically paint an object the color she wants and work it into her composition if needed. The work is rigorously formal yet never stiff; the surfaces have a loose brushwork and casual air that make them very inviting. The steely charcoal and ink drawings on Mylar are bold and almost architectural. Drawn with a confident stroke, towers of books lean on and support each other; traces of grid marks define the picture plane, and then disappear - forcing the eye to jump to the next landing spot. The drawings are punctuated with dark and light shifts that keep the gaze zipping back and forth. 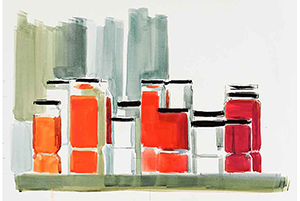 Jewel-toned bottles and jars in her watercolors are rendered with immediacy and a textural quality that is satisfying, painterly and engaging. The compositional structure of these paintings form a loose grid of their own via the broken black horizontals formed by the caps and lids and the vertical bands of color depicting both the tinted liquids and their reflections off polished tabletops. Peri Schwartz received her B.F.A. from Boston University in 1973 and her MFA from Queens College in 1975. Her work has been exhibited extensively for the last 30 years, and can be found in the permanent collection of numerous institutions such as the Museum of Fine Arts, Boston; Corcoran Gallery of Art, DC; Fogg Art Museum, Cambridge, MA; Hammer Museum, Los Angeles; The British Museum, London; The Arkansas Arts Center, Little Rock; Biblioteque Nationale de France, Paris; New York Public Library; and the Yale University Art Gallery to name but a few. Peri Schwartz lives and works in New Rochelle, NY. Copyright © All Rights Reserved by Peri Schwartz.